The opening of Bhutan House Restaurant marks a major milestone in the 20-plus year refugee journey of Kamal and Geeta Niroula. 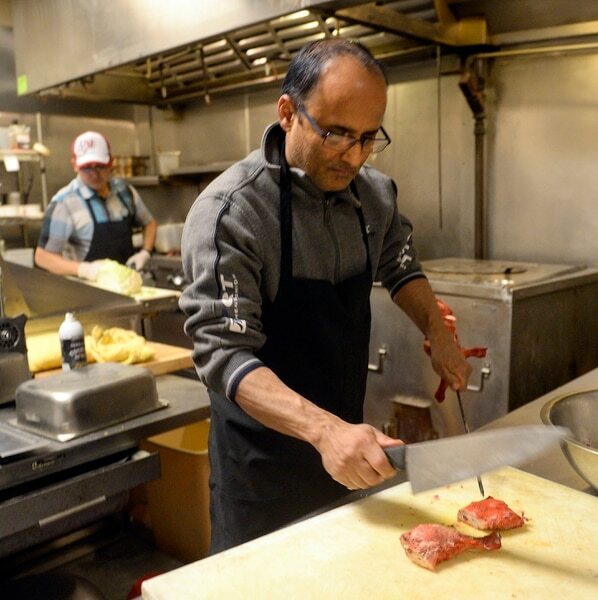 (Al Hartmann | The Salt Lake Tribune) Kamal Niroula prepares chicken for recently opened Bhutan House, in Sandy. Kamal and his wife, Geeta, moved to Utah with their three children in 2010. Originally from Bhutan, they lived in Nepal before their resettlement in the United States. The couple participated in the Spice Kitchen Incubator program, initially catering and doing special events before opening their own restaurant, which serves foods from Bhutan, Nepal and India. (Al Hartmann | The Salt Lake Tribune) Chef Binod Lohomi works to prepare several dishes for the lunch buffet at Bhutan House in Sandy. (Al Hartmann | The Salt Lake Tribune) Kamal Niroula and his two daughters, Kiki Sharma, left, and Shrijana Sharma, in the recently opened Bhutan House in Sandy. Kamal and his wife, Geeta, moved to Utah with their three children in 2010. Originally from Bhutan, they lived in Nepal before their resettlement in the United States. The couple participated in the Spice Kitchen Incubator program, initially catering and doing special events before opening their own restaurant, which serves foods from Bhutan, Nepal and India. (Al Hartmann | The Salt Lake Tribune) Kamal Niroula prepares naan, a traditional flatbread, for recently opened Bhutan House in Sandy. Kamal and his wife, Geeta, moved to Utah with their three children in 2010. Originally from Bhutan, they lived in Nepal before their resettlement in the United States. The couple participated in the Spice Kitchen Incubator program, initially catering and doing special events before opening their own restaurant, which serves foods from Bhutan, Nepal and India. (Al Hartmann | The Salt Lake Tribune) Chef Binod Lohomi, left, and Kamal Niroula work to roll out many dishes for the lunch buffet at Bhutan House in Sandy. (Al Hartmann | The Salt Lake Tribune) Srijana Sharma Niroula, daughter of Kamal, chops hot peppers for a hot sauce at Bhutan House in Sandy. Kamal and his wife, Geeta, moved to Utah with their three children in 2010. Originally from Bhutan, they lived in Nepal before their resettlement in the United States. The couple participated in the Spice Kitchen Incubator program, initially catering and doing special events before opening their own restaurant, which serves foods from Bhutan, Nepal and India. 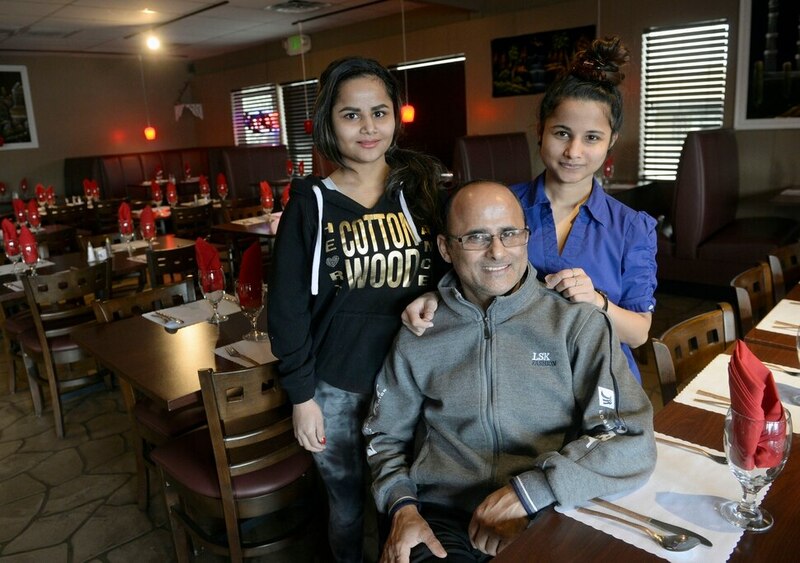 Sandy • A new family-owned restaurant, in a strip mall in south Salt Lake County, may not sound remarkable until you learn the backstory of Kamal and Geeta Niroula, the owners of Bhutan House Restaurant, 1241 E. 8600 South. Like many refugees, their 20-plus year journey to Utah followed a path through several countries and included years of determination, family support, career switches and the assistance of local agencies. 1. The owners traveled thousands of miles to feed you. The Niroulas were born in Bhutan, a small country on the eastern edge of the Himalayas bordering China and India. In the 1990s, as teenagers, they were among thousands of residents who were forced by the governing monarchy to leave their homeland in a series of ethnic cleansing initiatives. They settled in a refugee camp in Nepal, living there for nearly two decades. During that time, they married and were able to attend school. Kamal went to India, earning his teaching degree, while Geeta became a seamstress. When a resettlement process began, they had a choice to return to Bhutan or start a new life in a different country. The family — which by then included daughters Kiki and Srijana and a son, Raj, — decided to move to the United States. 2. You can try three cuisines at one restaurant. The foods of Bhutan, Nepal and India are reflected in the Bhutan House menu. Along with the traditional Indian curries, flatbreads and tandoori meats, customers can find ema datshi, a chile and cheese stew considered the national dish of Bhutan; thupa, a hot noodle soup from Nepal that comes in vegetable, lamb, chicken or shrimp versions; and delicate steamed dumplings found all over the region called momos filled with meat or vegetables. 3. The owners are graduates of the Spice Kitchen Incubator Program. Kamal and Geeta signed up for Salt Lake City’s Spice Kitchen Incubator Program in 2014, four years after arriving in Utah. Run by Salt Lake County Refugee Services and the International Rescue Committee, the program provides education and resources to immigrants, refugees and low-income residents interested in building a food business. Participants learn business basics, from developing recipes and analyzing food costs to understanding food safety laws. They also get help with financing, business license applications, health permits and marketing resources. The Niroulas launched a catering business, selling foods at local events such as World Refugee Day and the Downtown Farmers Market. In October, they were able to purchase the Sandy building and open Bhutan House. It’s the second stand-alone restaurant opened by entrepreneurs involved the Spice Kitchen program, said Kate Idzorek, the kitchen’s program manager. Laan Na Thai in Salt Lake City was the first. 4. It’s a place to get your goat. Goat is the most widely consumed meat in the world, but it’s just catching on in America and Utah. Bhutan House, open for lunch and dinner Tuesday-Saturday, celebrates this delicate meat with a mild flavor two ways: in a curry with ginger, vegetables and a spicy sauce; and in rice biryani with vegetables, nuts, raisins and spices. 5. The $10 weekday lunch buffet. Indian restaurants are masters of the all-you-can-eat lunch buffet. It’s a way to sample a variety of dishes for one low price whether you’re new to the cuisine or a seasoned diner. 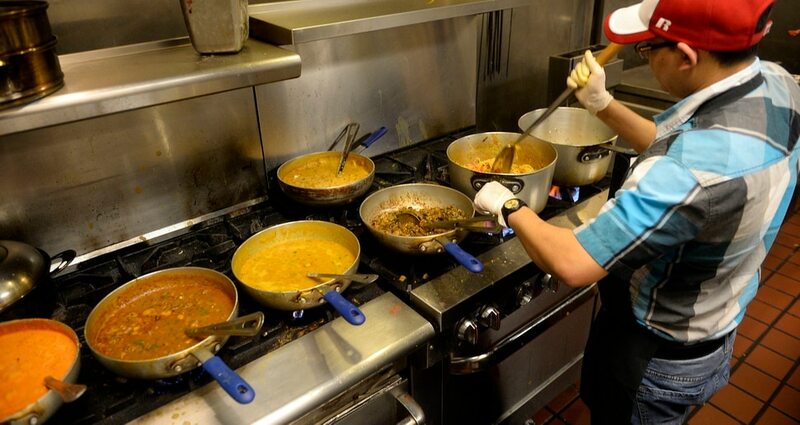 The Bhutan House buffet — served 11 a.m. to 2:30 p.m. — has a rotating daily menu. During a recent weekday visit, it included goat curry, chicken coconut korma, vegetable chow chow (noodles), bite-size vegetable pakoras, bhindi, tandoori chicken, rice, flatbreads and a variety of condiments — some to add extra heat; others, like yogurt-based raita, to cool things down. Rice pudding is available for dessert. The buffet price doesn’t include beverages, but for an extra $3.95, a mango lassi is a refreshing, but not-too-sweet drink made with yogurt.